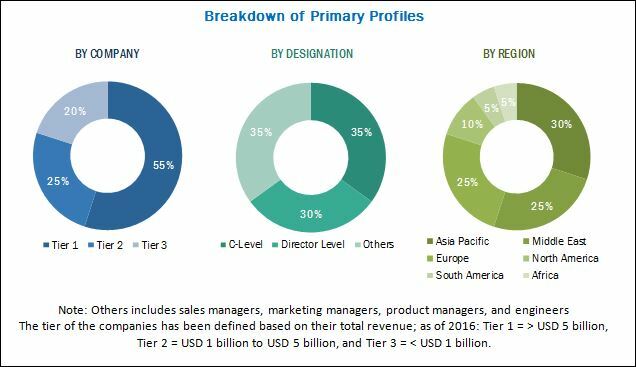 [159 Pages Report] The global power management system market was valued at USD 3.53 Billion in 2016 and is projected to reach USD 5.26 Billion by 2022, growing at a CAGR of 6.88%, during the forecast period. The increasing demand for energy efficiency in the manufacturing sector, increasing installation of renewables in the industry, and rising adoption of IoT and cloud-based platforms are driving the power management system market globally. This research study involved the use of extensive secondary sources, directories, and databases, such as Hoover’s, Bloomberg Businessweek, Factiva, and OneSource to identify and collect information useful for a technical, market-oriented, and commercial study of the power management system market. Primary sources are mainly industry experts from the core and related industries, preferred suppliers, manufacturers, distributors, service providers, technology developers, standards and certification organizations of companies, and organizations related to all the segments of this industry’s value chain. The points given below explain the research methodology. 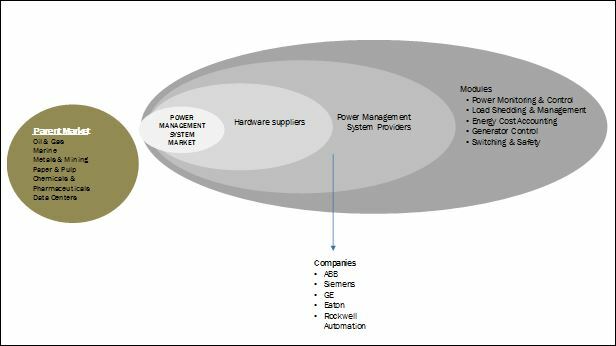 The ecosystem of the power management system market comprises companies such as ABB (Switzerland), Eaton (Ireland), Siemens (Germany), GE (US), ETAP (US), Wartsila (Finland), and Rockwell Automation (Japan). The global power management system market is estimated to be USD 3.77 Billion in 2017 and is projected to reach USD 5.26 Billion by 2022, growing at a CAGR of 6.88%, from 2017 to 2022. The increasing demand for energy efficiency in the manufacturing sector, rising installation of renewables in the industry, and rising adoption of IoT and cloud-based platforms are driving the market for power management systems globally. The power management system market has been segmented based on type into hardware, software, and services. The software segment is expected to be the largest due to the upgradation of existing software to the latest versions and upcoming technologies. The power management system market has been segmented based on module into power monitoring and control, load shedding and management, energy cost accounting, switching and safety management, power simulators, generator controls, data historian, and others. The others segment includes fuel consumption monitoring, alarms and annunciators, and consoles. The power monitoring and control module segment is estimated to hold the largest share of the market during the forecast period. The growth in the manufacturing sector in economies such as China and India and the growth in the oil & gas sector in North America are expected to boost the demand for power monitoring and control modules during the forecast period. 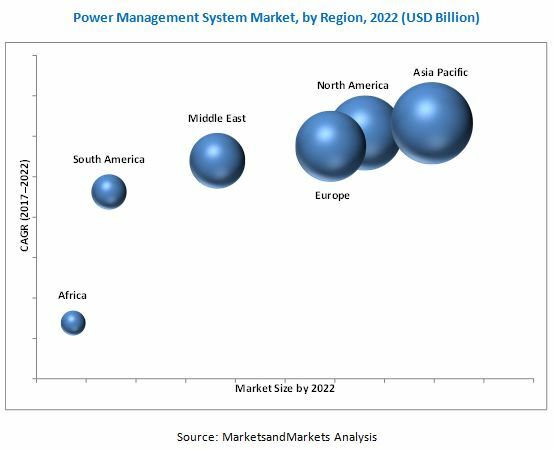 The power management system market has been segmented, by end-user, into oil & gas, marine, chemicals and pharmaceuticals, paper and pulp, metals and mining, utilities, data centers, and others. The others segment includes food & beverage, infrastructure, heavy engineering and automotive, and railway. The marine segment is estimated to hold the largest market share by 2022. The increase in the shipbuilding industry in the Asia Pacific region and Europe is expected to boost the market for this segment during the forecast period. The power management system market has been analyzed with respect to six regions, namely, North America, Europe, Asia Pacific, South America, the Middle East, and Africa. Asia Pacific is expected to dominate the power management system market during the forecast period. The increase in the manufacturing sector along with other industries such as metals and mining and data centers is the key factor driving the power management system market in the Asia Pacific region. The major factor restraining the growth of the power management system market is the risk to data security. Increasing occurrence of viruses and cyber-attacks is leading to security concerns. Valuable information can be stolen by malicious viruses in computer systems, which can cause a major loss to industries. Some of the leading players in the power management system market include ABB (Switzerland), Siemens (Germany), Eaton (Ireland), GE (US), ETAP (US), Wartsila (Finland), and Mitsubishi (Japan). Contracts & agreements was the most commonly adopted strategy by top players in the market from 2014 to 2017. It was followed by new product developments, investments and expansions, and mergers & acquisitions. *Details on Business Overview, Services Offered, Recent Developments, MnM View, Key Strategies, Might Not Be Captured in Case of Unlisted Companies.